Sherpa for Android has just launched in beta form on Google Play offering what the company believes is a better alternative to Google Now. The app has been built with the understanding that humans would rather talk to their devices in the same way that they would search on Google using only keywords. Rather than having to engage in a conversation with your phone Sherpa has been built to recognise not only normal speech but also key words letting people say single words such as 'Obama' and 'Age', offering what they believe is a much quicker service. The app revolves around the use of interactive cards so when a person or location is searched it will accumulate as much relevant information and then show it in card form giving key statistics (age, population size, birthplace, location) along with a small description. Users can then tap on any of these to expand into that specific area. The company also claims it is one of the first personal assistants that can clearly understand different regional accents, avoiding the stream of YouTube videos which surfaced after Siri struggled to understand Scottish iPhone users. While it's still in beta stage the app also comes with the ability to quickly share money to contacts via PayPal whilst a deal with record labels means Sherpa can stream music on command. Speaking to T3 last week, Sherpa CEO and Founder Xabier Uribe-Etxebarria raised his concerns that apps like Siri and Google Now had alienated smartphone users away from what is a potentially powerful tool. 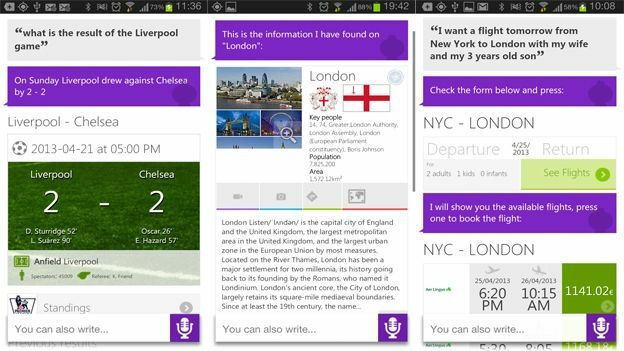 "They [Siri, Google Now] are not useful, people have ended up using them as games. This is because they use just a small fraction of what we are capable of doing with today's technology"
Xabier went on to suggest that one of the key problems with apps like Siri and Google Now are that it requires users to talk to their phones like a human being, something which they found people weren't comfortable with. "When we were developing the app the first mistake we made was that you were only able to talk to Sherpa as a person. People just don't work as we thought they would, they won't search 'How old is Barack Obama' they'll actually just want to say what they'd type which is 'Obama age'"
When asked about the future of this technology Xabier has high hopes for voice-controlled software saying, "What I want is for this to be the interface to our digital lives, all these things we are using at the moment Google Glass etc, they all work with voices."